This week in the war, on 4 June 1944, as the German rearguard retreated northwards out of Rome, the first few units General Mark Clark’s US 5th Army entered the southern part of the city. By mid-evening, the US 88th Division had reached the Piazza Venezia in the centre of Rome. 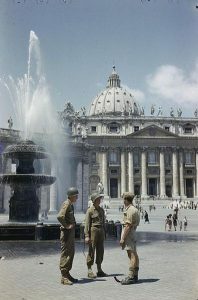 The following day, the Allies staged their triumphant entry and received an ecstatic welcome from the citizens of Rome. The Allied armies would continue to push northwards, in pursuit of the retreating Germans. As arranged, King Victor Emmanual III departed, leaving his kingdom in the hands of his son, Prince Umberto. This entry was posted in World War II and tagged King Victor Emmanuel III, Mark Clark, Prince Umberto, Rome. Bookmark the permalink.